A landmark study by University of New Brunswick researchers is shedding light on the work of nurse practitioners in the province for the first time since they were licensed to practise here in 2002. 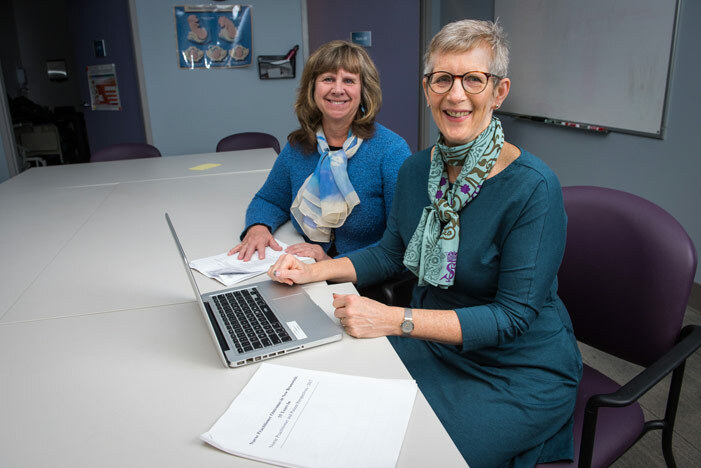 Senior Teaching Associate Sharon Hamilton and Assistant Professor Tracey Rickards, both of UNB’s faculty of nursing, collected survey data from close to 100 nurse practitioners and nearly 700 patients between July 2016 and March 2017. The purpose of the study was to examine the practice patterns of nurse practitioners in the province and the patient experience of those who see a nurse practitioner as their primary health care provider. According to Dr. Rickards, an examination of how nurse practitioners function in New Brunswick’s health care system is long overdue. The study found that nurse practitioners are currently working to their full scope of practice in a range of care areas, including family practice offices, community-based clinics, correctional facilities and schools. Both patients and nurse practitioners reported benefits of the nurse practitioner role in primary health care – notably a holistic patient-centered approach to health, including health promotion and disease prevention, education, increased accessibility, and longer appointments not limited to one concern. Important barriers to practice were also identified by patients and nurse practitioners alike. These included systemic issues such as a lack of continuity of care between the community and hospital, and a lack of funding models. A general lack of understanding of the nurse practitioner role among patients and within the health care system was also cited. Dr. Rickards and Ms. Hamilton hope the results of the study will help nurse practitioners, regulatory bodies and other stakeholders understand the contributions of nurse practitioners in the delivery of primary health care in New Brunswick, and guide future evaluations as the role continues to evolve. The study concludes with four recommendations for stakeholders, including government and regional health authorities, to better integrate nurse practitioners and to take full advantage of their potential as primary health care providers. “We are hopeful that the recommendations coming out of this study will help advance the nurse practitioner role as a salient solution for greater accessibility to healthcare for all populations through the inclusion of nurse practitioners in family health teams, unattached patient lists and other primary health care programs in New Brunswick,” says Ms. Hamilton. The study was funded by the University of New Brunswick’s University Research Fund and by the Nurse Practitioners of New Brunswick. Photo: Sharon Hamilton (left) and Tracey Rickards (right) at UNB’s Fredericton Downtown Community Health Centre. (Photo credit: Joy Cummings / UNB Photo).